Cocktails at the Kirchner Museum, drinks at the Steigenberger Grandhotel Belvedere, and a private dinner at restaurant Gasthaus in den Islen are just a few of the fancy PR events being staged by big banks this year at the World Economic Forum in Davos, Switzerland. The environment at Davos is expected to be much livelier and upbeat than in recent years, given that now many financial firms are killing it, rather than getting killed, when it comes to the bottom line. Even so, there will be some shop talk. In between client meetings and posh parties, bankers will be attending some panel events, including “The Next Shock: Are We Better Prepared?” (JPMorgan Chase CEO Jamie Dimon is expected to be on hand for this one) and "The International Financial System: Back on Track?” (Goldman Sachs President Gary Cohn is on the attendee list for that). In all, about 2,500 big swingers will be attending, including executives (in addition to banking CEOs, Bill Gates and Rupert Murdoch will be present), heads of state (of France, Germany, Russia and other countries) and celebrities (what's a meeting of the world's wealthiest without Bono in the house?). 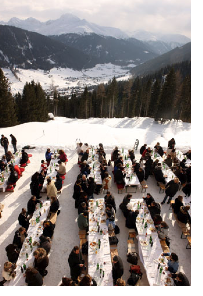 Of course, financial regulation will be a hot topic on the slopes and at apres-ski events. However, I'd be incredibly surprised if anything substiantial (and for the good of the world's economies) comes out of the five-day reveling but a boatload of hangovers, a handful of M&A deals struck, and further plans on how to exploit the expanding Chinese economy.